Securitas Electronic Security (SES) unveiled its new Canada headquarters during a ribbon cutting ceremony and open house on the afternoon of Tuesday, June 27, 2017. 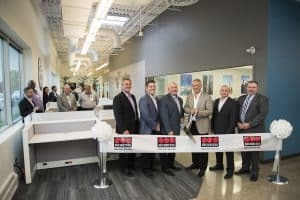 The grand opening event included an official ribbon cutting, luncheon and VIP facility tour for over 70 guests, including customers, business partners and associates. The new Toronto facility houses sales, operations and regional support for SES Canada operations. The building was completely renovated to support a company-wide contemporary look that uses a mix of advanced technology designed to promote more cross-team collaboration focused on the customer experience. The facility features a completely new customer experience video collaboration center, engineering center, warehouse and staging lab. The facility also features over 10,000 feet of work space and houses approximately 80 associates in a variety of roles that support the company; including service, installation and field operations, billing and collections, business development, sales and Canadian leadership.